Beer Grotto president Sam Short celebrates the grand opening of the first of several planned stores July 2 in Dexter. It’s been five years this month since I started writing about the local beer scene. To some people, I must sound like a Johnny One-Note. To others, I’m providing an important public service. To myself, I sometimes feel like a broken record. But beer in the Ann Arbor area just keeps getting better and more plentiful all the time and during this Michigan Craft Beer Month (a designation initiated, I believe, by Ann Arbor’s then-Rep. Rebekah Warren), it’s only right to highlight some of the great things to do and drink leading up to the Michigan Brewers Guild Summer Beer Festival July 25-26. » Tonight it’s all about wheats, wits, and lambics. You’ll find more than two dozen of them at Arbor’s July beer tasting, going down at the brewpub at 114 E. Washington St. from 7-9 p.m. Everything from hefeweizens to Belgian-style whites to krieks, sours, and other lambic styles. Tickets are $30 and include beer samples, tasting notes, an appetizer buffet, and groovy raffle prizes. Call 734-213-1393 or buy at the door, if available. » Up at The Links at Whitmore Lake, 1111 Six Mile Road, join the crew from Kalamazoo for a day of golf and Bell’s beer, beginning at 8 a.m. Enjoy Amber Ale, Debs’ Red Ale, Midwestern Pale Ale, and Oberon on tap in the clubhouse, and take cans of Oberon and Two Hearted Ale out on the course with you. » Head to charming downtown South Lyon for the annual Blues, Brews, and Brats Festival from 4-11 p.m. The event features live blues music, a beverage tent, and a best brat contest with local restaurants. The best part: Beers are provided by South Lyon’s own Witch’s Hat Brewing. More info at southlyonchamber.com. » What could be better on a shimmery, summery, sunny Sunday afternoon than drinking a cool brew in the beer garden while different DJs take away all stress with some infectious grooves. Yes, it’s another Halcyon Sundaze at the Arbor Microbrewery, 720 Norris St., Ypsilanti, from 2-9 p.m. Look for a small-batch brew of something tasty and say hi to yours truly on the decks. No cover (like anyone would pay to watch me spin some CDs). » Over at Ingalls Mall, the annual Townie Street Party kicks off Art Fair Week from 5 to 9:30 p.m. Live music, kids’ activities, food, and, most importantly, beer from Arbor Brewing are all on tap, figuratively and literally. Check it out before you leave town to avoid the crowds! » If you can figure out how to get there through all the construction, Whole Foods Cranbrook, 990 W. Eisenhower Pkwy., is hosting the crew from Dark Horse for another happy fun time from 5-7 p.m. Tap list TBD. » If you’re staying in town for the Art Fair madness, Ashley’s, 338 S. State St., has a way for you to beat the heat on the street. Stroll into the beer tent for the duration of the fairs and choose from multiple drafts of good brew sure to take the edge off. Tap list TBD. >> Over at the Whole Foods Market at 3135 Washtenaw Ave., from 5-7 p.m. the Bell’s team will be in-store for a sampling of Amber Ale paired with some freshly prepared goodies from throughout the store. 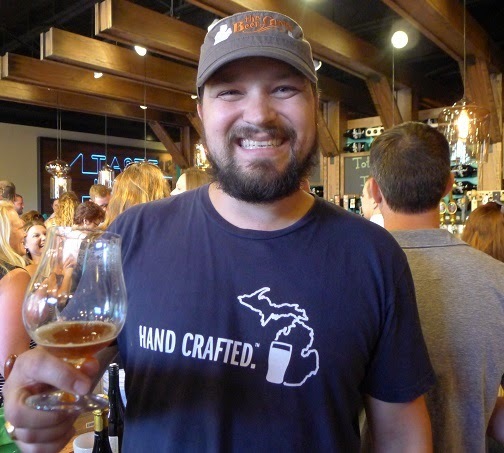 » Saugatuck Brewing takes over the taps at Whole Foods Cranbrook from 5-7 p.m. Come get some beer and groceries! Tap list TBD. » You’ll kick yourself if you’re not at Ashley’s by 6 p.m. for a special night of Bell’s and Sierra Nevada collaboration and solo brews. Look for the Bell’s/Sierra “Beer Camp Across America” brew, Maillard’s Odyssey Imperial Dark Ale, along with Bell’s Roundhouse Imperial Red Ale, Mercurial Belgian-style Ale, and Third Coast Old Ale, plus Sierra’s Hoptimum, Southern Hemisphere Harvest Ale, and Torpedo Extra IPA. » It’s the eve of the Michigan Brewers Guild Summer Beer Festival in Ypsilanti, which is kind of a big deal, so Ashley’s is celebrating with a special tapping of 20 selected Michigan beers, pouring beginning at 6 p.m. I would love to tell you which beers, but it’s a matter of state secrecy. You’ll have to come and find out for yourself, but don’t overdo it. You have a whole weekend of Michigan beer to get through. » Looking to have your mind blown and your taste buds explode? Well, if so, I hope you have tickets for the special New Holland beer dinner at Grange Kitchen & Bar, 118 W. Liberty St. The menu will feature a summer harvest dinner designed by Chef Brandon Johns and New Holland Vice President of Brand and Lifestyle Fred Bueltmann, who will be spending the day prior visiting local farms and businesses for the freshest and deliciousest. Tickets are $60, excluding tax and tip, and can be purchased here, if still available. Road trip update: The long-awaited Brewery Becker, 500 W. Main St., Brighton, opened its doors for business July 3. Come enjoy porter, shandy, and other fine brews in the beautifully restored three-story Victorian building. Find out more on the Brewery Becker Facebook page. Further north and east, River’s Edge is open at – truth in advertising – the edge of the river in downtown Milford, 125 S. Main St. Look for a refreshing Kolsch, Milford Pub Ale, Dirty Frank Stout, and most happily, English Mild Ale. Find River’s Edge on Facebook for menu, hours, and other details. Closer to home, Dexter’s Beer Grotto is also open at 8059 Main St. The hybrid bar and retail shop offers a unique way of buying fresh beer (and wine) from many different producers and is the first of many Beer Grottos envisioned by co-owner and president Sam Short. The second location is scheduled to open in Ann Arbor at 303 S. Ashley St. in September. Go to beergrotto.com to read all about it. Liberty Street Brewing, 149 W. Liberty St., Plymouth, is putting a new beer on tap this week: Eagle EyePA, their version of a “session IPA.” All of the hops and less of the malt, this one clocks in at 4.2% – perfect for some responsible tippling. Also new this week, Blue Tractor's Storm Sail White IPA, a 7.4% ABV pilsner brewed with wheat malts, hopped w/ French Aramis and Styrian Aurora hops, and fermented with Belgian yeast.